2018 IID Meeting Update: Systemic Inflammation of Aging Humans Comes from the Skin - Elias and Williams: The Inside-Out of Skin by dermatologists and skin researchers Peter M. Elias, M.D. and Mary L. Williams, M.D. Peter M. Elias, M.D. 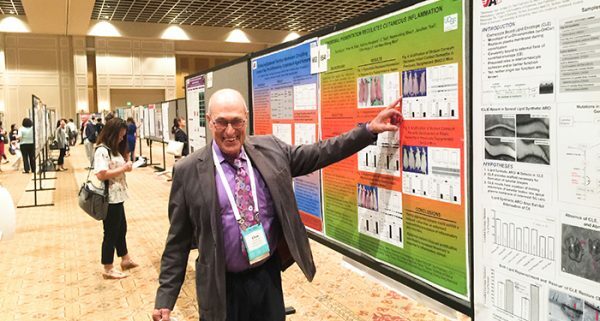 in front of his poster at the 2018 IID meeting. Could inflammation arising from aged skin actually be responsible for a whole host of age-related systemic diseases, such as Alzheimer’s disease, type II diabetes, osteoarthritis, and atherosclerosis? Markers of inflammation are found in the blood in all these conditions, but their source has yet to be unidentified – could they be coming from the skin? Some time ago our laboratory found that above the age of 50, the skin barrier begins to decline, and that it continues to worsen with more advanced age. This age-related impairment of the skin barrier is unrelated to the skin changes that result from a life-time of excessive sun exposures. We also learned some years ago that any time the barrier is impaired, the epidermis produces a broad array of regulatory molecules, called cytokines, in an effort to repair its barrier. These cytokines signal the epidermis to increase its production of additional waterproofing lipids and to make more cells (which in turn make more lipids!). Aged skin is no exception to this repair response, but in the case of aged skin these efforts fail to restore the barrier to its competence during youth. And because the barrier continues to be impaired, these cytokines continue to be released. Eventually, some reach the deeper layers of skin, causing the release of yet other cytokines, and, ultimately, provoking skin inflammation. Recently, our lab demonstrated that the increased production of cytokines by the epidermis of normal aging mice, eventually leads to the appearance of skin-derived cytokines in the blood. Indeed, in these experiments, we ruled out both the liver and thymus-derived immune cells as the source of the excess cytokines in the circulation of aged mice, as had been previously thought. Most importantly, we proved these cytokines were indeed coming from the skin, because correction of the barrier defect with a barrier-repair formulation returned the cytokine levels in the blood to those of younger mice. These animal studies suggested that many of the common age-related systemic diseases could be initiated or aggravated by an age-related deterioration of the skin barrier. But to make this relevant to human diseases, we needed to see if the same was as true for us as it was for mice. Could skin indeed be the source of the increased inflammatory markers in the blood as people age? At the 2018 IID meeting, we presented the results of study of barrier function and systemic markers of inflammation in a large cohort of Chinese volunteers. We found that correction of the subjects’ skin barriers using a triple lipid, barrier repair formulation reduced the blood levels of three age-linked, pro-inflammatory cytokines: IL-1 beta, IL-6 and TNF alpha. These studies demonstrate that skin is the likely source of much of the increase in circulating cytokines in the aged. And they raise the possibility that either maintenance of a normal skin barrier, or correction of a defective, aged barrier could decrease the prevalence and/or severity of several age-associated chronic disease. We are currently assessing the link between age-related cytokines from the skin and atherosclerosis. Stay tuned, here.